The holiday shopping season of 2018 shattered all previous records in terms of e-commerce sales. Yet a survey of 350+ e-commerce professionals shows merchants remain plagued with performance, availability and security issues. This article was originally published in Internet Retailer on Feb 7, 2019. Consumers spend billions of dollars online between October 1 and December 31, especially during the holiday shopping season. As a result, the fourth quarter is the most crucial (and the most lucrative) time of the year for most ecommerce merchants. To be successful, ecommerce leaders must plan well ahead of time and ensure their online storefronts are prepared for the dramatic increase in demand. It’s a daunting task. The massive and unpredictable increases in site traffic seen by online merchants during this time of the year often reveal how effective an ecommerce site’s infrastructure is in managing demand while still delivering a great digital experience. Webscale conducted a survey of more than 350 ecommerce professionals regarding how their online store’s infrastructure performed during the fourth quarter in 2018. The primary goal of the survey was to find out how ecommerce businesses performed during the holiday season in terms of site performance, uptime, security, revenue, and overall growth, and to identify site infrastructure challenges faced by ecommerce professionals today. The holiday shopping season of 2018 set records as consumers spent more over the period than ever before. According to another industry report, Cyber Monday in the US alone racked up online spending of close to $7.9 billion, resulting in the largest online shopping day in the country’s history. According to our survey, 76% of ecommerce professionals claimed that 20% – 50% of their annual revenue was generated between October 1 and December 31. For about 6.5% of them, the fourth quarter contributed 50% – 75% of annual sales. 78% of online merchants experienced up to 30% growth in Cyber Weekend sales compared to 2017, while an additional 11% ecommerce businesses saw up to 50% growth in revenues. About 3.7% merchants grew their sales between 75% and 100%. But how exactly did the ecommerce industry fare infrastructure-wise during this time of the year? 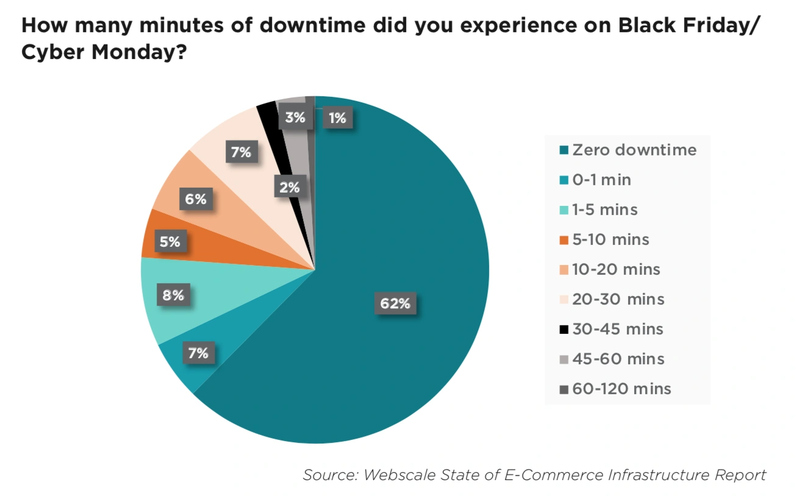 Our survey revealed that while 23.85% of online merchants saw downtime in excess of five minutes, 5.5% merchants went down for over 30 minutes. Site downtime is common during the holiday shopping season as online stores are inundated with thousands or millions of shopping requests, but it doesn’t need to be. This has immediate and enduring repercussions—ranging from loss of revenue and customer loyalty to erosion of brand image. Several big names such as Barneys New York and Ulta Beauty saw downtime during the Cyber Weekend and a few of them apologized to shoppers via social media and email. Our survey showed that 56% online stores experienced page load times upwards of 3 seconds. Over 30% saw page load times exceeding 5 seconds. 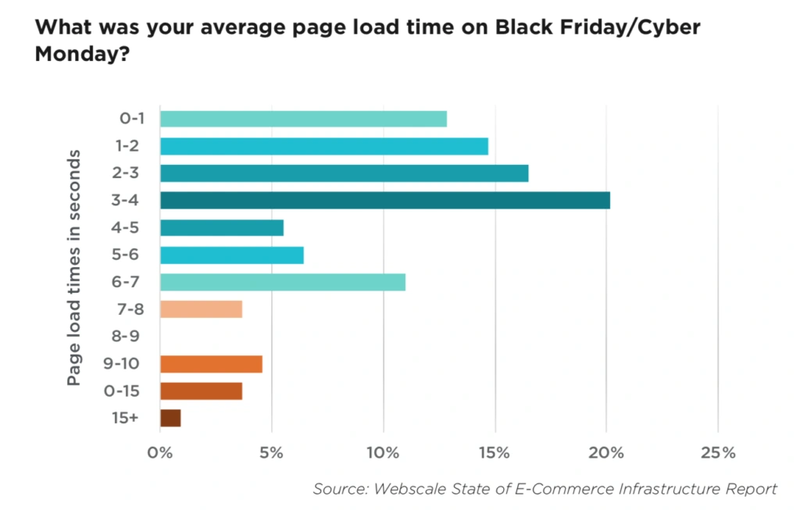 And for about 9% ecommerce sites, the load times were at 9 seconds or more. These figures are far from acceptable. Site performance is one of the most important factors when it comes to delivering a great user experience and increasing conversions. With more consumers buying online than ever before and holiday spending running into the billions, hackers and cybercriminals are being presented with an opportunity too good to miss. 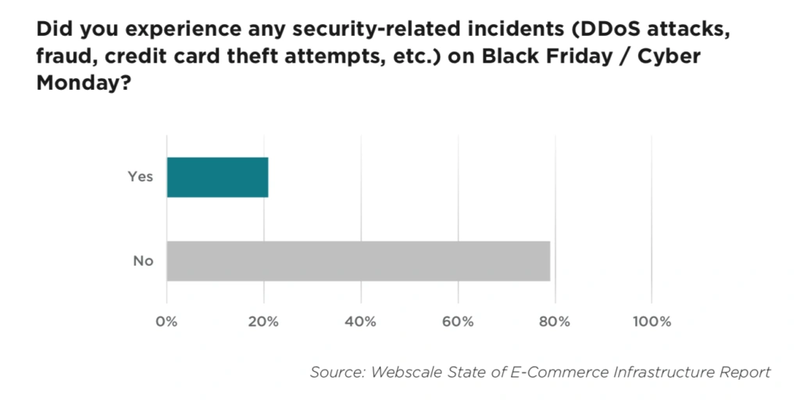 According to our survey, 21% of online storefronts admitted to experiencing security-related incidents: DDoS attacks, fraud, credit card theft attempts, etc. Others likely did, but perhaps did not realize their impact. Another industry report found that DDoS attacks on online storefronts went up by more than 70% on Black Friday and a staggering 109% on Cyber Monday when compared to any other day in November. With cyber attackers getting more sophisticated by the day, and with their intent shifting from executing basic DDoS and ransomware attacks to stealing highly valuable identity data and credit card information, most online merchants need a massive security upgrade. A significant number of ecommerce merchants, especially in the mid-market, are still stuck with legacy hosting environments that are static, and therefore, face challenges with scaling on demand. They are also plagued with severe performance limitations and security vulnerabilities. According to our survey, 6.4% online merchants said downtime was their No. 1 challenge on Black Friday / Cyber Monday, 11.9% had site slowdown issues, and 9.2% cited cyber-attacks as their primary issue. 18.35% online merchants said they were struggling heavily with all three challenges. Ecommerce needs a serious infrastructure upgrade. 100% uptime, blazing fast site performance, and comprehensive security are critical to delivering a great digital experience for shoppers, while protecting their identity and credit card information from bad actors. Our survey results seem to indicate that merchants are headed in the right direction. While 36.1% merchants are on the lookout for solutions to improve site performance, 24.1% are considering solutions to eliminate downtime. 29.6% online businesses are looking to upgrade their security infrastructure. 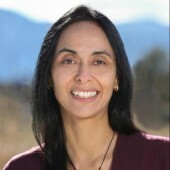 Sonal lives and works in the San Francisco Bay area with her husband, Gaurav, their two children, Rayan and Reyna, and a poodle. She spends all her energy on family, Webscale, reading and long 'thinking' walks.